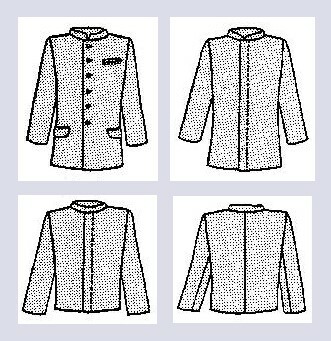 Pattern includes 4 interchangeable band collar styles, optional pockets & use of hooks, snaps or buttons. Two length options: �wamus�/ regular�suit coat length or short work coat. Fully lined. From Friends Patterns. Specify one size: 36, 38, 40, 42, 44, 46, or 48.